DRF Pneumatic Rotary Actuators can be utilized in many industrial, R&D, lab, production and quality inspection applications which require rotary motion. These pneumatic actuators can handle small to medium size payloads with rotation up to 180° and can be mounted and operated in any direction. Productivity improvements and cost reduction of repetitive task can be automated in some of the following applications: assembly; escapements; in-line directional changes; transfer of objects with precision movements. The modular design allows use with DLT Linear Slides and pneumatic grippers and optional adapter plates are available for additional savings through fast assembly and reduced machining time. Linear motion pneumatic components are double acting air cylinders that require a dry air supply with filtering to 40 microns or better. For best control of pneumatic rotary actuators, flow control valves (regulating out) should be installed to regulate the speed of the device. Position sensors can easily be added to motion components to detect the end of travel positions of the actuators, they are the standard method of communication with the PLC and are available in inductive or magneto resistive sensing styles and come in both PNP or NPN sourcing signals. Sensor Mounting Slots Standard mounting slots for Magneto Resistive Sensors magnet mounted in piston standard (sensors sold separately). Case Hardened Rack and pinion are case hardened for wear and long life. End Stop Deceleration (-A Option) Shock absorbers decelerates load at end of stroke. Extremely Rugged Design Pinion is supported with upper and lower sealed ball bearings. One Piece Body One piece lightweight aircraft quality aluminum body. Black Anodize Body The body and End Plates are Black anodized, steel parts are black oxide. Dowel Holes Slip fit dowel pin holes in bottom body, and on turntable. Piston Made of Delrin® for extended life. Mounting Patterns Tapped and Dowel mounting surface on bottom of body and on turntable. 참고: All models end stop adjustability 23°, over travel (each end) 1 to 3°. 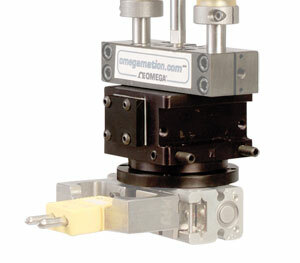 Recommend accessories include 2 sensors and 2 pneumatic flow controls for each slide, along with a 4-way 2 position valve. DRF-075M models: actuation time [180° @ 7 bar (100 psi) 0.38 seconds], actuation time [90° @ 7 bar (100 psi) 0.29 seconds]. DRF-094M models: actuation time [180° @ 7 bar (100 psi) 0.38 seconds], actuation time [90° @ 7 bar (100 psi) 0.29 seconds]. DRF-106M models: actuation time [180° @ 7 bar (100 psi) 0.38 seconds], actuation time [90° @ 7 bar (100 psi) 0.29 seconds]. DRF-131M models: actuation time [180° @ 7 bar (100 psi) 0.38 seconds], actuation time [90° @ 7 Bar (100 psi) 0.29 seconds].